Summary: Facebook is shutting down Partner Category targeting for all advertisers as of October 1, but you don’t have to lose the value they provide, as long as you take action before August 15. Creating new campaigns with a specific focus and purpose will allow you to “mine” Facebook’s audience data and keep targeting Partner Category users beyond October 1. Here’s how. Earlier this year, in response to privacy concerns, Facebook announced that it stop allowing advertisers to use of third party “Partner Categories” to target their ads, effective October 1. Many advertisers have looked at October 1st as the “end date,” but the more important date is August 15, which is the deadline for creating new audiences and campaigns using partner categories. 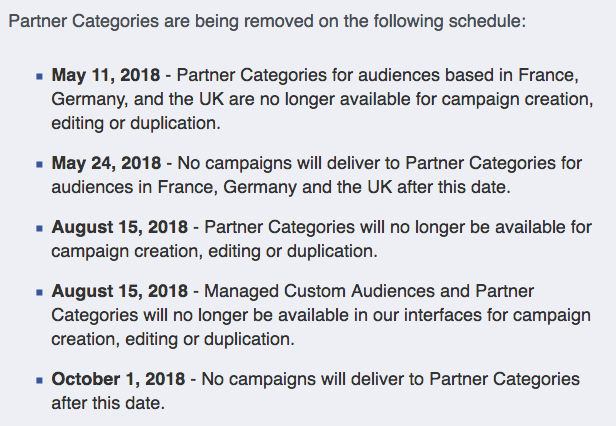 In fact, if you have the right campaigns running before August 15, you can keep on using Partner Category targeting for all of your ads well past October 1. I’ll explain how to do that in this post. Partner categories allow advertisers to target people on Facebook, based on data provided by third parties. Large data brokers like Axciom and Epsilon collect information on consumers through partnerships with banks, credit card companies, and loyalty card programs, among other sources. Using Partner Categories allows advertisers to get better ROI, by making sure that their ads only reach people who are, for example, frequent buyers of dog food, purchasers of luxury gifts, holders of premium credit cards, and much more. When combined with Facebook’s regular targeting options based on interests, etc. Partner Categories have been a powerful tool since they were first introduced in 2013. How useful are partner categories? Well, I have never encountered a business that couldn’t gain a lot from this kind of targeting… but it hasn’t exactly been free of charge. When advertisers use Partner Categories, Facebook charges an extra 15% for any campaigns that use third party targeting. This is how data providers get paid to provide the data, and it’s an additional expense that many advertisers have been paying on every campaign. In many cases, unnecessarily, since they already had the ability to target the same people in another way. I’ll explain – because it’s key to how we’re going to keep targeting these people, even after October 1. There are thousands of categories available – but as you can see from the example below (targeting buyers of children’s apparel), the party is about to end… or is it? 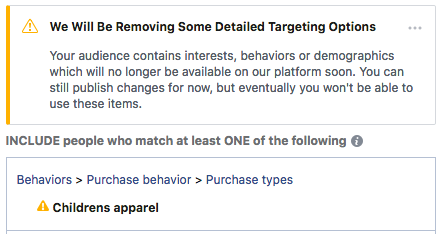 Yes, it’s true that Facebook won’t let you target people via Partner Categories as of October 1. It’s equally true, and far more urgent, that you won’t even be able to start a new campaign targeting an audience with Partner Categories as of August 15. Keep that date in mind – because that’s how long you have to identify every partner category that matters to you, get new campaigns built if necessary, and build your OWN audience of those highly-targeted users. We’re going to build THAT audience using your Facebook Page’s “Page Post Engagement (PPE)” audience, which is automatically created by Facebook and composed of everyone who interacts with a post on your Page. 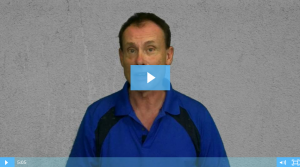 Our strategy is simple, and straightforward. Identify the people / categories that you want to target, and run campaigns that focus on engagement (rather than conversion) to “mine” the partner category members into your PPE audience. Once you have them in your PPE audience, you can run your usual ads to that audience, and you’ll get the benefits of a higher response rate (conversion) and a lower cost (because there’s no 15% “data tax”). In fact, if you’ve already been advertising to partner categories, you’re probably kicking yourself right now for paying an extra 15% when a whole bunch of the people you paid extra to reach were in your PPE audience all this time. To start with, go to Facebook Ads Manager account and navigate to the Audiences tab. Create a Saved Audience for every combination of interests and partner categories that you like. 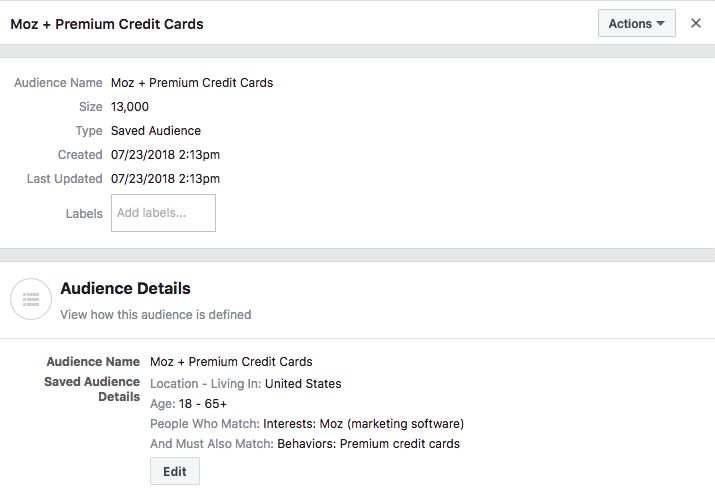 Here’s a simple example, using a single interest (Moz) and the partner category “premium credit cards.” This gives us an audience of 13,000 Facebook users in the U.S. who are fans of Moz and have premium credit cards like American Express. We could expand this to include tools other than Moz, and as long as we keep that filter on to target only people who fit the partner category, we can harvest a whole bunch of the people we want to reach into our PPE audience. If you’re not an old hand at Facebook advertising, stay tuned. Tomorrow, I’ll post my step-by-step audience building guide, which makes it easy for anyone to pick out the best targeting to use for any kind of business. This might be news to you, but if you want to reach more people on Facebook without paying more to do it, one of the most important variables in the newsfeed equation is Engagement. I know a lot of advertisers who simply don’t care about the engagement rate on their ad campaigns, but those advertisers are not seeing the whole picture, and it’s costing them a lot. To Facebook, the engagement rate for a post (or ad) is almost like the click-through rate is for Adwords advertisers. Higher engagement means greater reach at a lower cost. Because our primary goal is to get people into an “engagement audience,” the best kind of ads to use aren’t even ads at all. In fact, the best kind of ads to use for this purpose are third party stories – news articles, blog posts, or videos – that your target audience is likely to respond to. If I want to target fans of Moz, all I have to do is find the most popular posts on their site (like those Whiteboard Friday videos), write a little teaser text for my Facebook post, and share a link to the post from my own Facebook page. When I boost that post, Moz’s fans are going to engage at a very high rate, so I can reach them very cheaply and add them to my PPE audience, where I’ll be able to continue to reach them at an even lower cost. You’re going to want enough stories (links) to share one every day from now until October 1st, but at the very least, you need to find ONE story that you can start boosting to your saved (target) audiences before August 15. As long as your campaigns start by then, you can keep adding new posts (as ads in an adset) all the way until October 1st. Of course, we have documentation and training available, and I’ll release the latest version of our Facebook content strategy guide, which tells you exactly what kind of stories to use, right here on our blog, this Wednesday. Now that you know who to target, all you need to do is grab the links you need, write teasers, set up 8 weeks worth of Facebook posts, schedule them to post daily, and boost each one when its day comes around. You want your harvesting campaigns to use the Page Post Engagement objective, and each saved audience will need at least a $1/day budget to keep running. This might sound like a lot of work, and it is if you do it by hand. Of course, you don’t have to do it all at once, as long as you don’t let your campaigns die. Just remember, if you’re not up and running by August 15, you can forget the whole thing. I wouldn’t be doing my job if I didn’t mention that ResultFlow (our marketing automation software) can automate the entire posting process, and works seamlessly with Adespresso to make sure that each post gets written (you don’t have to write it), posted, and boosted right on schedule. All you have to do is select your saved audiences, create campaigns in ResultFlow and Adespresso one time, and tag the stories you want to share via your web browser. You can set it up once, feed it 5-7 stories a week, and everything else is done for you by software. The whole thing takes under an hour to set up, and it will automatically harvest the partner category users you want to reach into your PPE audience. 1) You can try to do this yourself, by August 14, but you’re running out of time. 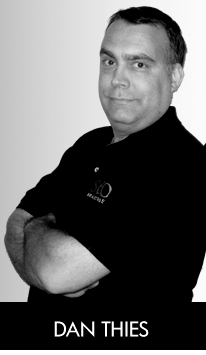 2) You can sign up for ResultFlow Solo and do it the easy easy way for $97 per month. It takes 2-3 hours of your time to set up your campaigns on Facebook, automate everything with ResultFlow, and get your campaigns up and running. 3) You can hire us to do the whole thing, but we need you signed up before close of business on Wednesday August 8 to guarantee that we’ll be able to complete our work on time.